Hurricane Sandy affected many people. Anything we can do to help those that have suffered losses would be greatly appreciated. Living on Long Island during this difficult time, I'm grateful that my family is safe and my home was left undamaged. Although it was difficult to go without power for 10 days, I had to keep reminding myself that the important thing was that I had my family with me and a roof over my head! Unfortunetaly for many, this was not the case. So, in the month of November, Close To My Heart will donate $1 to for every Stamp of the Month set sold to support Red Cross relief efforts for those areas of the US severely affected by Hurricane Sandy. 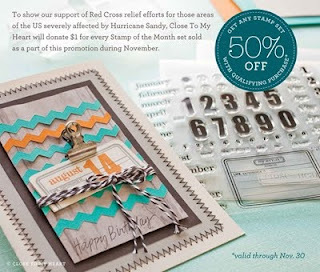 In November, you will also get 50% off another stamp set when you buy the stamp of the month for just $5. Visit my website to place your orders today! Blog Makeover by Designs by Sarah's Blog Makeover Service using customized graphics.